"The underlying thread that ties all this together is the inconceivability of a moral order based on an authority more fundamental than one’s own reason or experience. That was the founding principle of the Enlightenment, and that is the cornerstone of the most recent generation. So how can we say the Enlightenment is over?" Interesting. What do you think? And does the label matter as much as the question of gospel presentation? Or, is gospel presentation more effective with an understanding of the former? All good questions to think during my lunch break at my desk! Can harvest pumpkin brownies determine a day's delight? You can argue, but I have a Tuesday chock-full of evidence to hold up against your argument! I have a sneaky little suspicion that this string of so-good-very-great days is no accident. It's a little something called overflow. I'm no physicist, but I'll propose a theory called "overflow" to explain this strange turn of events of the past week that has resulted in an abundance of joy. If you'd really like to know, the formula is complicated and cumbersome, so I will give you the wordier version (which happens to be my expertise). I wish I could just write the numbers and letters and slashes and signs, because delight too often eludes description. Let me paint you a picture on this flat-screen canvas. I know... I just read over this "paint" list and I wish I could give each ambiguous phrase a story as perfect as the reality I am walking through. The bottom line is... my delight is not about the pumpkin brownies as much as it is about the overflow of my delight in the Lord. God keeps pouring more of Himself (Romans 5) out through His Spirit and I can't help but burst with joy. I keep thinking it's the coffee, but now I'm convinced it's the overflow. The more the Spirit pours out into my life, the more overflows everywhere else. People get blessed... God gets glorified... and it's another good day. But, tonight I feel I have to fail at any further explanation and ask you to take my word for it! Here are some tangibles that have inspired: Andrée Seu has an article on Psalm 40:3 that spoke directly to my heart Tim Challies shares thoughts on being a better listener (a message I always need to hear) and also how we can make frugality an idol as Christians I've got a little something stirring with my partner in cooking crime here ... but only click if you want to discover the collision of two worlds in a kitchen :) Desiring God National Conference just happened this past weekend and I am slowly but surely going to listen to as many of the messages as I can. I hope the next time I start a blog submitting I have some sort of theory it ends better than this! You may not believe it, but Mondays are capable of bizarre to brilliant status. When you start the day off with your clothes on backwards, you have to wonder how things are going to go down. Add to that a proclivity for post-weekend depression (especially after one so beautiful), and you've got yourself a recipe for Monday morning disaster! It's pushing 10 pm right now and I won't hesitate in saying this Monday shone brilliantly! I want to pack it neatly into a pretty package and send it to you, so your day might open just as wonderfully, but since I cannot this list will have to suffice. I know all of these elements are a result of God's great goodness (and in spite of me), so maybe your Mondays can sparkle too! Last night, I set out my outfit for today and therefore squeezed at least seven more minutes into my morning coffee-quiet time-journaling routine. My morning soundtrack is bumping with some new tunes. Before school even began, the smile would simply not be suppressed... a group huddled outside my office and I cannot tell you why, but I couldn't help the top-of-the-morning tilt of the head and lopsided smile. Mondays always add an extra boost because we have chapel in the morning. There's something about standing with my seniors in worship that gives me goosebumps every time. (I also love that they've been bringing their Bibles lately... nevermind that it might be due to a little baking bribery :) A little bribery always worked just fine for my Aunt Jane during swimming lessons! We are gearing up for another SLEEPOUT this year on October 22nd and the first promo ran in chapel today... the excitement is building! Though it is temperaturally (made up that word) impossible in Honduras, it felt every bit like fall today, from the bold sun to the cool breeze... and I wanted to burst out singing Patty Griffin's "Heavenly Day" at the top of my lungs. Over lunch, I got to pray with a beautiful, dear co-worker and God made Himself so alive in those moments of community. Armed with a can of pumpkin and after beautiful discussion on every topic imaginable (so deep I missed our turn), I started what might make Mondays most beautiful this year. If that interests you, check this out. On the car ride home, I belted OUT some mad tunes from Starfield, Bright Eyes, and Joel Rakes. Now, night. I get to sleep sound, curled into my bed. I praise God for brilliant Mondays! Here is something to start off your morning... a message from Francis Chan that he gave this past weekend at the Desiring God National Conference in Minneapolis, Minnesota. I woke up this morning still thinking about it and challenged by it in my morning devotions (ironically on the self-centeredness of Saul). Anyway, if you feel like meditating on 1 Corinthians 8:1-3 and growing a heart for your brothers and sisters, you better listen. via Think Hard, Stay Humble: The Life of the Mind and the Peril of Pride Desiring God 2010 National Conference Think: The Life of the Mind and the Love of God - Desiring God. When I worked in Austin, Texas, I saw this bumper sticker in the parking lot of the university I worked for: "Don't pray in my school and I won't think in your church"
I realize bumper stickers are often cowardly ways to make big, bold statements, but this one rubbed me the wrong way. I wrote this blog post in reflection. Now, three years later, I want to add a postscript to that blog post. John Piper has a new book out called, "Think" and it examines the questions so many raise and so few answer. Why do we have a mind? What is the purpose of thinking? The Desiring God National Conference was actually going on this weekend and focused on just that - using our minds to glorify God, enjoy Him and share Him. I get goosebumps thinking about how our minds are made to glorify our Creator! I'm off to worship this morning in spirit and in truth... glad for God's design to engage my thoughts with His thoughts. I wish I could post this video on the back of my car in bumper sticker form. Better yet, I wish I could live life proving this video true. How about that for a rebuttal? let LOVE FLY like cRaZY. Last night, we experimented with a recipe from my Good Housekeeping Healthy Choices cookbook. The recipe was for tortilla pizza, but we transformed it into a lasagna and it was so wonderfully delicious! My roomie is a veggie (my affectionate term for the vegetarians in my life), so I'm always on the lookout for recipes that we would both like. This one turned out to be the BOMB! Then, for dessert, I made baked apples with a recipe from the same cookbook in an effort to welcome fall to the rain and sun of this country that knows not the four seasons. Tonight, I'm having my high school girls over for movies and THIS incredible apple cinnamon cupcake dessert! Doesn't it look amazing? Shredded apple replaces some of the oil and keeps the cake moist in these cinnamon-spiked cupcakes. There is a generous amount of fluffy marshmallow frosting to mound or pipe on top for a festive look. via Apple Cupcakes with Cinnamon-Marshmallow Frosting. We'll see how it turns out! ****UPDATE**** Here is the result of several hours in a warm kitchen... lots of laughter... and maybe a few foibles. The recipe is posted below the slideshow. To prepare frosting: Bring 2 inches of water to a simmer in the bottom of a double boiler. Combine 1 cup brown sugar and 1/4 cup water in the top of the double boiler. Heat over the simmering water, stirring, until the sugar has dissolved, 2 to 3 minutes. Add reconstituted egg whites, cream of tartar and pinch of salt. Beat with an electric mixer on high speed until the mixture is glossy and thick, 5 to 7 minutes. Remove the top pan from the heat and continue beating for 1 minute more to cool. Add vanilla and 1/2 teaspoon cinnamon and beat on low just to combine. Spread or pipe the frosting onto the cooled cupcakes and sprinkle cinnamon on top, if desired. "If it's worth doing, it's worth doing right." Thanks, mom. I grew up angry at these eight words because hard work was always the guilty result of this catchy little phrase. It appeared when we discussed our 4-H livestock projects and how little we had worked with them (if you are not from the country, you wouldn't understand leading a cow around by a halter in your yard). It wedged into conversations about refinishing projects and youth group commitments and grades in school. Many a conversation ended with a knowing, stern look from either Mom or Dad and these words, "If it's worth doing, it's worth doing right." Now, working with youth, I wish more parents used this guilt trip method to motivate their kids. I realize guilt should not mainly motivate us to do things 'right,' but guilt is not the lesson that has stayed with me these 25 years. The lesson is about worth. Last night I watched one of my favorite movies - Steven Spielberg's "Amistad." In one of the last scenes, the attorney speaks on behalf of the Africans being prosecuted for insurrection on the slave ship where they were so inhumanely transported in the slave trade en route to Spain. "Yea, this is no mere property case, gentlemen. I put it to you thus: This is the most important case ever to come before this court. Because what it, in fact, concerns is the very nature of man." At this point in the movie, something very human in me connects with the John Quincy Adams leaning against the polished hardwood handrail. I want to shout, as his quiet words seem to do so well, "Yes, gentlemen, what are WE WORTH? What is man worth?" Is our nature - the nature of man - carry some inherent value or is rather something to discard? I can tell you what I felt about our worth as I watched one of the captured Africans, Cinque, struggle against the chains that bruised his wrists and neck. We were not made for this. In Genesis, when God breathed life into the man He'd formed from the dust of the earth, He was intentional. His ways are perfect, so I refuse to believe any part of His creation process was not done "right." Every piece and particle, from the smallest micro-organism to the most complicated systems in the human body, God designed us exactly right. In His image we were made (Genesis 1:26-28), male and female He created us in His image. I can't help but think my parents' old adage came from a deeper understanding of God's own very intentionality in our design. If creation was worth doing at all (and, I'll admit, sometimes I wonder), then God would be the only One able to do it right. I really believe the 'nature of man' is a question of beginnings, which (not so ironically) is what the word "genesis" means. Our genesis (beginning) is bound up in the intentional mind of a sovereign God, whose purposes are forever, beautifully... right. I say all of this because I am pondering what it means to live life. I made up a word last week when I was trying to process the biography of Bonhoeffer because I was grasping at dictionaries to find a description for his approach to living out theology. I came up with vivology, after a quick greek/latin roots and suffixes search. The question bouncing about in my head lately has been, "How do I live right?" Because, I know live is worth living (God's intentional, perfect design)... so it must be worth doing right. Christians have a bum rap. Whether or not this title is earned, many people look to Christians for examples of ultimate hypocrisy (oh, how little has changed in thousands of years!) instead of examples of ultimate servants. I was reading this article over at the Desiring God blog and I really believe it's a message we need to allow to take root in our hearts. I'll admit, Christians can be so stubborn and fearful about theology that we miss the point in living out what theology tells us. In our absence, others step in and try a hand at serving, loving, and giving without the power of redemption at the center. Their efforts, no matter how amazing, simply cannot take the place of life-altering redemption and a secure eternity. The world is groaning (Romans 8:22) for redemption and (NEWSFLASH) Christians aren't the only ones feeling the pains of childbirth. The human race, along with creation, is desperate to right the wrong condition of things. But, there is only one option for redemption and that is through Christ. And in Christ alone I am qualified to do good works. If the God of the universe is making all grace abound to me, so that I may abound in every good work, I think it is important to seek out the work. Think of it - God is sufficient in all things and at all times and it is HE who makes me able to abound in every good work. I believe God is calling us to Himself... calling us to obey... and calling us to live in the delight that will come as a result of our committed hearts (Ecclesiastes 5:20 and 2 Chronicles 16:9) working in day-to-day acts of service. I want to live BELIEVING so strongly in God's story of redemption that I wake up LOOKING for ways to abound in every good work. It's not charity or public policy or brownie points... it's simply life lived in the bounty of His grace to the glory of His name! Here is the article from the Desiring God Blog, written by Matt Perman as he prepared to speak at the upcoming conference: Christians Are to Be Proactive in Doing Good. rain, rain, it will stay... until January! As much as we would like the rain to go away, this news article says it will stick around until January. The ground is already saturated and all the excess water makes a treacherous course down the mountains and hills, causing landslides in its wake. Much of the coffee and sugar cane crop has suffered terribly due to the rain, so this prescription of rain until January is more than bad news. Read this article and join me in prayer for the people here in Honduras. Click here for the article. You will need to translate the page (unless you are fluent in Español), so if you are using a browser capable of translating like Google Chrome, that is best. These pictures below are from the article and show some of the patterns and movement. Don't ask me to explain them... I am just relaying the information! Honduras is affected by the phenomenon of rain has already happened in the 50's. A phenomenon called the Pacific Decadal Oscillation has distorted the thermohaline circulation and is producing more rain than they should. The country is practically in the line of hurricane formation and climate affect Pacific and Atlantic. This morning as I read this article, I was reminded that our comfort and refuge and peace is not a place in the distant future, but a promise for right here and now. Be encouraged today by Seu's words and remember that God invites you into His presence to experience His joy and perfect peace. After Hurricane Matthew loomed on the north coast this past weekend, a safe place seems much more urgent. In God's grace, Tegucigalpa escaped with only rain, but our brothers and sisters in the North are feeling the repercussions of the tropical storm. Always - in times of uncertainty and in times of great promise - we will find a welcome location. Amen? Here's the full article: God, my place. I'm sitting here, under my tree, with books stacked high to my right and my heart full to overflowing with thanksgiving. 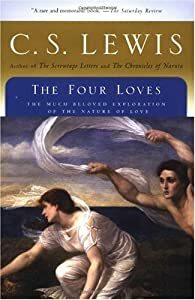 I just spent way too much time looking at old blog posts trying to find some musings from the book, "The Four Loves" by C.S. Lewis, but I came up empty-handed. I'll have to rely on my memory to relate the bliss I'm feeling and how I think Lewis explains it best. It is only fitting, I might add, that I'm comfortable under my tree, where roots are stretching out underneath, reminding me where I find life. Many of you are probably well aware of Lewis's famous book on the four different types of love, but I want to just skim the surface of what has me flying so high tonight: friendship. Lewis suggests (apologies for my crude summary) that friendship draws out God-designed parts of us that we never knew we were hiding. In community, we are able to watch God reveal Himself in us because of the way we are made to live in community together. Today is a repeat of so many other times in my life where I realize there is joy bubbling up in my soul that is set free when I place myself in community. It's like a pen full of words that finds paper or a box full of seeds that finds ground. Community is a place God has specifically designed to reflect Him and point to His glory. I love how C.S. Lewis says that God ordains our friendships. There are certain people ordained for certain times in our lives for a very certain purpose - to draw out ways in which we never knew we were capable of giving God glory. I can't tell you all the ways this makes sense for today, but I can tell you that this day (beginning, middle, and end) made me ready to burst with the joy and inspiration of community. God's design is so very good! Here is one of the reasons for my joy... one of my students Alejandra! She has a wonderful way of drawing out something strange and silly and spectacular... and I always walk away blessed! I hope you are intentionally putting yourself in the company of others who are pursuing Christ. You will be so blessed by the new ways you find to give God glory for His design! As always, .let LOVE FLY like cRaZY. I love it when people call me granola... although I don't think I deserve it. If you are not familiar, it's a term people use to describe someone who is a bit on the rugged side, earthy, probably makes chai from scratch and can, without much effort, throw on anything and pull it off. Again... not me, but I love my granola friends! I also love... making GRANOLA! My roommate brought a recipe she actually got from her roomie last year and we made it yesterday and WOW. So good! I thought I would indulge you with the recipe and encourage you to try your own variations and report back! Combine wet and dry together and mix thoroughly. Spread onto 2 cookie sheets and bake for 30 minutes. Flip and bake 30 more minutes. It's best if it is spread out thin - crispier that way. eat on its own, with yogurt or milk... all the time!! I scanned the last sentence of Eric Metaxas's Bonhoeffer and it was regret that stared back when I saw the next page titled, "NOTES." Over 500 pages of a beautiful submersion into a life lived completely and I find myself wishing the book were longer so that I could walk next to someone who understood how theology spilled out into and gave purpose to *viviology (knowledge, study, and act of life or living). Few people, especially those blessed with academic minds, are able to meet the needs of the former without sacrificing the demands of the latter. Bonhoeffer refused to only stand behind a podium in the high brow, organized classrooms of universities and behind closed doors of churches. The more he learned and studied, the greater he felt pulled toward living out the Truth he so passionately taught. I love how he didn't abandon the books and the study to live among the people in radical opposition to his intellectual contemporaries' expectations. "The sermon has been reduced to parenthetical church remarks about newspaper events. As long as I've been here, I have heard only one sermon in which you could hear something like a genuine proclamation ... One big question continually attracting my attention in view of these facts is whether one here really can still speak of Christianity, ... There's no sense to expect the fruits where the Word really is no longer being preached. But then what becomes of Christianity per se? The enlightened American, rather than viewing all this with skepticism, instead welcomes it as an example of progress. In New York, they preach about virtually everything; only one thing is not addressed, or is addressed so rarely that I have as yet been unable to hear it, namely, the gospel of Jesus Christ, the cross, sin and forgiveness, death and life." It's funny ... how timely these words are today. Maybe "sad" better describes how far we've come since Bonhoeffer's evaluation in 1930. We preach on "virtually everything" but what will reach, save, and transform lives. We preach on trees and health and wealth and all the ways the world is evil, but we don't preach Christ. Could it be because we are scared of the price? Bonhoeffer's approach to life was, in large part, informed by God's approach to grace and discipleship. "cheap grace is the preaching of forgiveness without requiring repentance, baptism without church discipline. Communion without confession. Cheap grace is grace without discipleship, grace without the cross, grace without Jesus Christ." "costly grace confronts us as a gracious call to follow Jesus, it comes as a word of forgiveness to the broken spirit and the contrite heart. It is costly because it compels a man to submit to the yoke of Christ and follow him; it is grace because Jesus says: "My yoke is easy and my burden is light." "
I still cannot figure out how Bonhoeffer merged his knowledge with his life, but I can certainly see that he did. For three months in 1931, he conducted confirmation classes in rough neighborhood of Wedding. He took the post shortly after being ordained and the zeal with which he approached the class of fifty boys might have been characteristic of a new minister, but the care and perseverance he applied in every aspect of his teaching was unique. His life with those boys emphasized community and sacrifice. The textbook was not drudgery, opened with great pain and resistance. The Text was carried around in their hearts and gave the greatest joy to its living out. 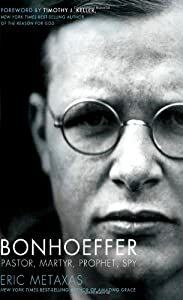 Even as the very church he helped to build up (The Confessing Church) failed to stand for Truth when it mattered most, Bonhoeffer's resolve grew only stronger. He believed that he had been "grasped" by God - that he had been chosen for something. But, that something was only important because of (and dependent on) the God who decides to break through and use people, sermons, and situations for His glorious purposes. He resolved to not only preach Christ and Him crucified, as Paul declared in his letter to the church in Corinth, but he endeavored to LIVE in obedience to Christ's costly call to follow as a disciple. How do we marry Theology and *Vivology? I think it means knowing the Word so well it becomes a part of you. I think it means keeping your bookshelves loaded and guarding time for study, even if technically no longer a student. I think it means dedicating uninterrupted times of prayer. I think it means loving Truth because you believe in your deepest soul it redeems and reveals life. I think it means fellowship around campfires and crazy games of soccer. I think it means coffee and conversation and debate. I think it means keeping Jesus Christ at the center - recognizing that every good gift is only good because God wills it to be so. And, I think it means delighting in this life. I think it means being deliberate about our thanksgiving - walking in each day knowing that God's glory is what shines bright to reveal He is at the center. *I might have just made up this word, but give me credit because it's got two parts that should work together - viv is the latin/greek root word meaning "live" and ology is a suffix used to describe bodies of knowledge. I'm trying to say that, just like we aspire to grasp theology, we must also pursue a grasp of vivology and a combination of the two. What is knowledge of God without a life lived out as a result of that knowledge? And really, how does one know about 'living,' exactly? Please pray - Hurricane Matthew is on the way! I'm not sure how much longer I will have power, but with the ground already saturated from an unseemly amount of rain during this rainy season, there will surely be flash floods and landslides. Pray especially for those who have houses on mountains and precarious places... and for those without shelter. Here's something I wrote in May when my friend Heather was visiting, but it certainly applies to tonight. I just got home from a MARVELOUS night of capture the flag with my favorite seniors, then dinner, then dinner #2, and then various antics following. I think my joy almost burst a couple times I was so full of it! I laughed and laughed and laughed and I praise God for every surprising snort and crazy convulsion. I love laughter. I will have to write more about that later. For now, enjoy this REPOST from May. -------------------- After a crazy day, an afternoon filled with charades and catch phrase and laughter, and a typically cheesy serenade for the 11th grade girls... Heather and I went for coffee and finally caught up a bit. I chose the Latte Au-Lait, which means I am now WIDE awake and she's zonked out (getting the sleep she needs so we can leave at 5:45 am to lead worship tomorrow at staff devotions). I just want to write something quick tonight... maybe it will turn into a poem, but right now it's just thoughts about pleasure. As I think about the students and this culture and (maybe) popular culture in general, I decide that our greatest sin is pursuing lower pleasures. I know C.S. Lewis probably illustrated this idea more deeply than my brain can think it right now, but still it seemed a mini-revelation tonight. God promises in Psalm 16:11 that in His presence there is FULLNESS of JOY and at His right hand there are PLEASURES forevermore. Wow! What a promise! NOT ONLY that, but also pleasures forevermore. God offers us pleasure that never ends - He created us with the desire for pleasures forevermore and He is delighted when we pursue the highest kind. He planted that little seed inside us, in the soil of our humanity, that tries to break the surface and soar toward the sun... all the ways our humanity longs to have pleasure can be traced back to the way we were created in His image to experience pleasures forevermore. The moment I decide to pursue a less pleasurable pleasure than what I was created for, I am choosing sin. I know, it sounds confusing. Usually we associate pleasure with sin, but right now I am saying that we sin when we pursue less pleasure or lower pleasure. Because I know God created me and placed in me a desire to have infinite joy and pleasure, I know that anything less than a pursuit of THAT means two things:1. I am not experiencing the most pleasure possible (can only be found in and through God)2. I am trying to make lower pleasures fulfill my God-given desires for the BEST pleasure (which, of course is a fail from the start). God created us, knows us, and delights when we are absolutely bursting with joy. Normally, this day would have already ended. I'd be tucked in my bed and flipping pages (trying frantically to finish with Germany and Bonhoeffer so I can read over all the scratches I've made in the pages) until I finally fall asleep. Not so tonight. After school and a teachers' meeting, I met up with the first of two Vivians. We caught up and zoomed around town and jammed out to Coffey and smiled the perfect amount. I wrote this back in May of last year... full post here. I'm going to try to start re-posting some of my writing and poetry here so that I can have it in one place. I'll admit, it's also kind of fun to see what has found its way to the cyberpages over the last couple years. How faint the fool who treads the way and tarries about; runs blind to the fray. How heavy the heart, hardened by years of abuse and betrayal and manmade fears. How sad the sigh learned by repetition - disappointment, abandoned by man's wild volition. How complete the chasm built with words great; explanations attempt determine eternal fate. How stuffed the souls with semantics and speeches and tolerant voices crowding out holidays at beaches. How lost the lonely, desperate to find a rhyme or a reason to be sanctified. How dead is this end and reason to fight, with an honest confession - broken and contrite. How firm the foundation, without shame, is the cross that bears my Savior's name. How perfect the peace in God's Word alone that restores and revives a heart once of stone. I have a history (see fright story 1 and fright story 2). Before you ask about a traumatic encounter I had as a small child, I am completely unaware how this dreadful thing started. All I know is, surprises often find me on the floor or grabbing the nearest arm. I've become pretty good at recovering from these episodes. Unfortunately, the stories keep piling up! The only good thing to come out of this fright syndrome is that I have crazy good material to make people feel better about their follies. I love to see people walk away saying, "I might be embarrassing, but HER stories make mine look like nothing!!" So... with that, I'll give you some material to refer back to the next time you feel foolish. Location: Office Cause: 7th grade student, Ricardo Story: I'm not sure why, but I arranged my office so my desk and I face the wall opposite the open door. So, when students or staff come in quietly, I am unaware. It just so happens that Ricardo is a very wonderful and mischievous 7th grade boy who had not been informed of my response to surprises. Last week, as I worked away at my desk, Ricardo slipped in and gave a shout directly behind my chair. With the scream of an adolescent girl, I jumped and promptly fell off my chair, grasping the edge of my desk as I went. The worst part is the few moments following, when I realized the entire hallway had heard and several classes wondered who had just seen a ghost. SO embarrassing to have the guidance counselor be (rightly) the one to blame for such an interruption! Location: Micah Project Cause: Nelson slammed a door or dropped a chair, I'm not sure which Story: This past Sunday, I was spending some fellowship time at the Micah house... and by fellowship, I mean, ducking from flying soccer balls and rough-housing with the boys who behave like wild brothers. So, we were fellowshipping and I had turned my back for one second from Nelson when I heard the most surprising BANG and my hand shot out, uncontrolled, toward Kristi who happened to be right in front of me. I grabbed her arm and scattered my feet until I regained my composure and then hid my head in her shoulder... Ah! The worst weakness to show a bunch of adolescent boys is that you scare easily! They wouldn't let me leave without making me jump a hundred more times! Location: Victoria's house Cause: this time I'll blame it on the dark and the cowboy boots I love Story: I had just spent some wonderful time hanging out with Victoria, a senior who has a special place in my heart, and her new puppy Milo. The cowboy boots were a gift from my mom this summer, anticipating the birthday in October when I'll be here. It's amazing how boots can make such an impression - it pretty much carried my smile all day long, straight up until I was walking out her front door. It was dark and we were talking... and then next thing I knew I was floating backwards through the air and onto my back in the grass. Slow and fast quite together explain the descent, but once I was there comfortably situated in the soft grass, I realized how silly it must all look to the guard who stood a few feet away! Victoria could barely pull herself together to help me up, she was laughing so hard. So, I lay there in my green cotton dress and cowboy boots, looking helpless and embarrassed as red punch. When I finally got up, I said, "Victoria! Oh my gosh, you can't tell anyone that I just did that!" but, moments later I followed, "uh... just kidding, I'm sure I'll tell everyone tomorrow!" I'm re-posting this story because I could not afford to pass it up. This so clearly articulates what my emotions seem to keep me from saying. After studying at a Christian liberal arts college and then working at a different liberal arts college for a year, I have grown to respect "creation care" with a healthy disdain for its deception. Deception? You ask. Yes, deception. When we are torn from the MAIN THING and convinced that other things are just as important, we have lost sight of Truth. As you can read in this article, we can even cleverly REPLACE the central message of the Gospel with a different message entirely. NEWSFLASH: The new message doesn't save. Read the article here: ‘Green Awakenings’ and Missing the Point of God’s Story. I am merely reposting this here. I wrote it originally in 2007. I am a coward. Oh man, oh man I am a pathetic coward. But I am healing, heavy under the fragrant weight of mercy - for words spoken, promises broken, conversations averted, open doors ignored. can these things be forgiven - these repeat offenses? the same voice stuck always when its throat should sing the eruption of song on the hazy horizon, waves crashing, storms threatening, but glory well living. Oh, but the effort is so great; the community meets, lives, retreats, but this conversation of confusion .interrupts. how foolish a coward. how foolish a coward.